On November 22nd, our production department staffs of Xinxiang Yulong Textile Co., Ltd. held a site meeting on the theme of improving product quality. First of all, the workshop quality inspectors put forward the feedback from the guests. According to the criticism of the guests, we found that although our products are in line with the product inspection standards through the production process, some customers will have more stringent requirements. 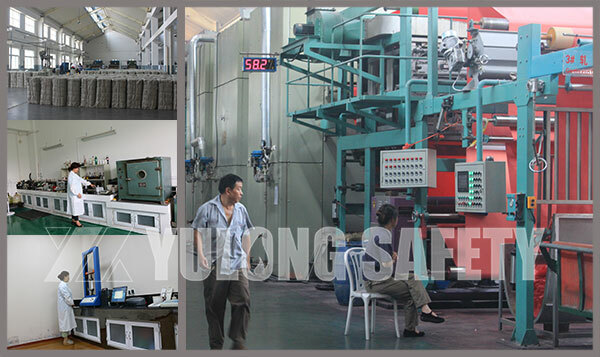 Therefore, this also requires us to carry out the quality inspection in accordance with the customer's standards in the future quality inspection, strictly control all aspects of production to meet the needs of customers. The workshop technician suggested that in the winter, there are hot steam and cold air crosses in the workshop. It is often to condense on the cloth surface, which is easy to form water mark on the surface of the fabric, which causes the product quality failure, so we need to pay special attention to the cold and warmth of the production workshop. To reduce and eliminate condensation in the workshop water vapor. In addition, the chemical raw materials and additives used in the production process should be carefully handled in accordance with the operating instructions to prevent agglomeration in cold weather. In the production process of pre-treatment, desizing and bleaching, the low temperature would bring negative effect on boiling and drying result, resulting in poor fabric texture. Therefore, the slurry on the grey fabric needs to be processed more fully, so that the dyeing is smooth. If the effect is not good, it is necessary to find the reason and timely re- bleaching to ensure that the fabric effect and to avoid dyeing problems. Finally, the workers in the workshop also raised some problems that often occur in the winter, such as easy to happen steam leakage, uneven drying, slowing down the speed, colored strips, etc., all of which require our attention to avoid in advance.In the flame retardant processing, it is easy to appear white splotch on the fabric.It is requiring workers to patrol and inspect. When problems are found, they should be found in time and quickly resolved for the optimal quality of our flame retardant fabrics. Throughout the meeting, everyone had shown concern about the quality control and problem prevention. Finally, the participants agree that it is the common responsibility of each employee to eliminate problems and improve quality.